Anterior: Deep fascia of the leg. Medial: Lateral surface of the shaft of the tibia. Muscles: 4 muscles (tibialis anterior, extensor hallucis longus, extensor digitorum longus, and peroneus tertius). Nerve: Deep peroneal nerve (anterior tibial nerve). With the exception of the Tibialis anterior which appears from tibia, all the muscles of the anterior compartment of the leg originate from the Fibula. All are supplied by the deep peroneal nerve and dorsiflex. * MP: metatarsophalangeal, ** PIP = proximal interphalangeal, *** DIP = distal interphalangeal. It’s a spindle-shaped multipennate muscle. It’s the most medial and superficial dorsiflexor of the foot, which is located against the lateral surface of the tibia. 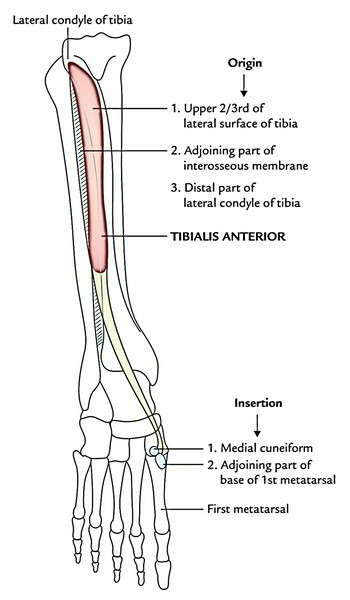 Upper 2/3rd of the lateral surface of the tibia and adjoining part of the lateral condyle of the tibia. The muscle fibres converge below to create a tendon that is related to the lower 1/3rd of the lateral surface of the tibia. It pierces the medial part of superior extensor retinaculum and the upper group of inferior extensor retinaculum. Now it enters medially underneath the inferior group of inferior extensor retinaculum to be added on to the inferomedial side of the base of the very first metatarsal bone and adjacent part of the medial cuneiform. By the deep peroneal nerve. It’s the leader dorsiflexor of the foot in the ankle joint. It keeps the medial longitudinal arch. It functions as an inverter of the foot at the midtarsal and subtalar joints. To analyze tibialis anterior medically, request the patient to stand on heels or dorsiflex the foot against resistance. If normal, its tendon can be viewed and palpated. Anterior tibial compartment syndrome/shin splints (Fresher’s syndrome): It happens because of overexertion of the muscles of the anterior compartment particularly when the untrained men who lead a sedentary life are requested to walk or run for long distances. Shin splints also appear in trained runners who don’t warm up. Muscles of the compartment swell inside a tight compartment because of unexpected overuse that might impede venous return resulting in accumulation of more fluid in the compartment with unyielding walls. The pressure tends to compress the anterior tibial artery, and reducing the blood supply to the muscles, resulting in ischemia and pain. It’s often viewed in freshers (example, recently accepted medical students/ recently recruited military employees) who are made to run excessively. Therefore, this condition is also called military fresher’s syndrome. The anterior tibial artery is the key artery of the anterior compartment of the leg. It corresponds to the posterior interosseous artery of the forearm. The blood supply to the anterior compartment of the leg is bolstered by the perforating branch of peroneal artery. Hence, the size of peroneal artery is inversely proportional to that of the anterior tibial artery. The anterior tibial artery is escorted by 2 venae comitantes. The anterior tibial artery descends through the anterior compartment on the interosseous membrane. In the distal leg, it lies between the tendons of the tibialis anterior and extensor hallucis longus muscles. It leaves the leg by passing anterior to the distal end of the tibia and ankle joint and continues onto the dorsal aspect of the foot as the dorsalis pedis artery. In the proximal leg, the anterior tibial artery has a recurrent branch, which connects with the anastomotic network of vessels around the knee joint. It’s the nerve of the anterior compartment of the leg and dorsum of the foot. It corresponds to the posterior interosseous nerve of the forearm. The nerve associated with the anterior compartment of the leg is the deep fibular nerve. This nerve originates in the lateral compartment of the leg as one of the two divisions of the common fibular nerve. The deep fbular nerve passes anteromedially through the intermuscular septum that separates the lateral from the anterior compartments of the leg and then passes deep to the extensor digitorum longus. It reaches the anterio interosseous membrane where it meets and descends with the anterior tibial artery. The deep fibular nerve innervates all muscles in the anterior compartment then continues into the dorsal aspect of the foot where it innervates the extensor digitorum brevis, contributes to the innervation of the first two dorsal interossei muscles, and supplies the skin between the great and second toes.